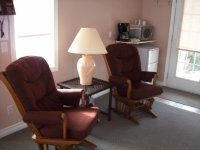 Our three 1 Bedroom Motel Suites come complete with kitchen facilities, full bathroom, gas fireplace, & satellite TV. The bedroom features a queen bed and the sofa features a queen size pull out. The Motel Suites sleep up to 4 people. Logos Land also offers 1 Efficiency Unit that sleeps 2 people. Tax not included in above prices. Payment due in full upon booking. Deposit refunded less $25 handling fee if cancelled 21 days prior to scheduled arrival date. No refund if cancellation is within 21 days of scheduled arrival. Free Parking. Access to electric vehicle charging station.